A passion for process, a penchant for powerpoint and the equivalent effort of pushing a Discovery to Wolverhampton and back every day, led Talented Individuals Combined to win TIC in 2016, with their idea to improve piston nest recirculation in zone 2 in the petrol assembly hall. The trio, made up of Simon MacDonald, Tracey Ridgeway and Jason Moore, not only gained friends and networked with colleagues outside their usual working areas, but also built confidence, feeling empowered to make key decisions about their careers, based on the skills they learnt during the ten-step process. All agree that TIC was a challenge, but an incredibly rewarding experience, professionally and personally. Simon, who works in hot test in petrol assembly found that Tic helped him realise what he wanted to do, leading to him taking a step back from his team leader role and focusing on career progression in a totally difference area. It’s a path that he continues to travel, but without TIC he may not have had the confident to follow. “TIC gave me confidence in my ability to choose, refocusing on something I really wanted to do, which ultimately led me to quality through hot test and a focus on lean systems and tools, improving processes. Simon had a couple of reasons for joining the team. Having faced the possibility of having to give up on TIC in its pilot year, due to his team folding, he got talking to Tracey and Jason and realized his skills on powerpoint could really help them both. Before he knew it he was part of the team. Jason is a team leader in zone two in the petrol assembly hall. Prior to joining Jaguar Land Rover he worked for a company selling large construction machinery within the construction industry. One of his clients was JPE Aggregates, who helped to complete the groundworks on the i54 site, before the EMC was built. “I saw TIC as a great opportunity to meet new people in areas of the EMC that I would never have met in my role in petrol assembly. This was really important as I was relatively new to the facility. Since joining the EMC I’ve met some great friends and being a TIC winner was an amazing experience, albeit nerve-racking, having to stand up in front of hundreds of people. It was as much about controlling the nerves and having the confidence in what we were presenting. Personally I had applied for a team leader position before TIC and been unsuccessful. The TIC process gave me new skills and between that and the experience of being at the EMC for longer when I applied again I was successful. 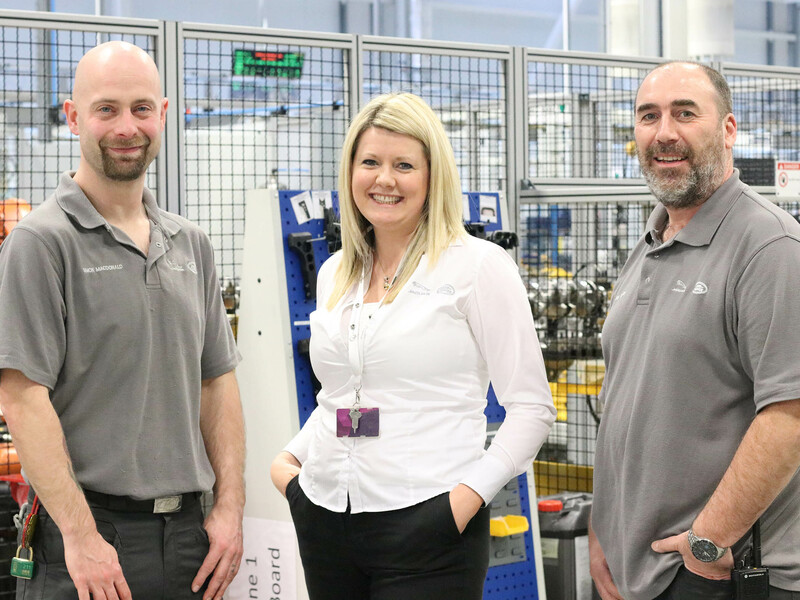 Three years on from the project, Tracey Ridgeway has also seen some significant changes, having taken time off to have daughter Emmie, she’s back with the business in a role in MP&L, after previously being a process leader in petrol assembly. She says the job is a better fit, but also offers career opportunities in the future. She said: “I look back on TIC and realise that is was a massive undertaking. We met every week and received some fantastic support from our TIC coach Chris King. “I think we were drawn together because we felt really passionately about the project. For Jason it directly affected his working area, for me as a process leader in the assembly hall, I wanted to work with my team to make improvements and for Simon, after a bit of a false start, he found that he could help us, with an area of the project where we may have struggled. “TIC improved our relationships with our peers in our local area, but also gave us an insight into others areas of the business, helping to build our networks across the facility and beyond. And would Talented Individuals Combined recommend TIC? Absolutely. TIC improved our relationships with our peers in our local area, but also gave us an insight into others areas of the business, helping to build our networks across the facility and beyond.